Buying your first home? You must check your credit score! Ensuring the accuracy of your credit score could save you time and money. To qualify for the best home loan rates possible, be sure to correct possible inaccuracies before they interfere with your home buying plans. Visit FreeScore360 and get all 3 scores for FREE. Your credit score largely determines if you qualify for a loan and what interest rate you will receive when buying your first home. It is important that you confirm the information in your credit profile is accurate. Checking your own credit does not affect your score. First time home buyers must run their own credit report with 3 scores to get an idea if they may qualify for the best programs. Do not let everybody run your credit because it will lower your score. A 620 credit score is the minimum score you can have to qualify for the first time home buyer program. There are many people whose credit scores are in the low to mid 500 range who need to work on their credit and they should be able to buy within 6 months to one year. I had bad credit 30 years ago with a 400 score, Ouch!, but I worked hard at fixing my credit and I improved my credit score to 720+ in recent years and now I have a great mortgage rate and low loan payment on a beautiful new home. Contact us at 847-516-5743 or email Dream@FirstHomeBuyers.net for more information on credit scoring. You need to have 4 credit accounts with 12 months on-time payment history to qualify for most first time home buyer programs. The USDA zero down payment program only requires 2 accounts but you need to have an additional 2 non-traditional accounts such as rent, utilities (gas, electric, water, etc. ), cell phone, car insurance, health club or any other account you make regular monthly payments. If you have no credit history, you can start building credit by obtaining a secured credit card which reports to all three credit bureaus. Visit NerdWallet.com to check out some secured card offers. With secured cards you make a deposit to protect the credit card company in case you don't make the payments. Also, there are secured cards available which do not require a credit check or checking account. Once you get a secured card you will probably get some offers for unsecured cards to help you establish more credit history. 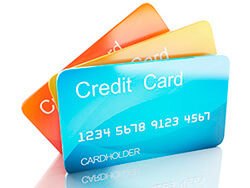 You must keep a low balance on these credit cards which should be no more than 30% of the credit limit. For example, if your limit is $500 then your balance should never exceed $150. Building credit is about making on-time payments not how much you spend. You should be able to build up sufficient credit history within 12 to 18 months and should be able to qualify for the first time home buyer program. First of all you need to fill out full application and run a mortgage credit report because the mortgage credit report scoring model is different than online and other credit scoring models used by auto dealerships and credit card companies. Lenders use the middle score which is the most important factor for loan qualification and it is determined by dropping the low and high scores. For example, if you have credit scores of 600,640,650, the middle score is 640. You do not average the 3 scores. One great advantage about getting pre-approved through us is the fact that our credit report indicates how much you may improve your credit scores for each credit bureau. If your credit score doesn't meet the minimum requirement to qualify for the program then we can run your credit through a simulator to determine how we may improve your credit scores by obtaining new credit or paying off some debt. For example, I had one person with a 610 credit score and he was able to improve his credit score 60 points within 30 days by paying down the balance on one of his credit cards. Today, he is a happy homeowner. We are not credit repair consultants but the potential score improvement indicators and credit simulator are great tools to use to raise your credit scores. Don't max out your credit cards and keep the balance on each card at 30% of your limit or lower. Don't have a lot of inquiries on your credit report. Don't close out credit cards. You can pay them down to zero balance but closing an account may lower your credit score. Don't pay off collections until you speak to a loan professional. 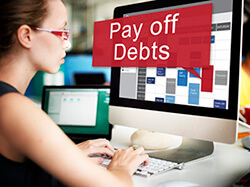 Paying off collections may temporarily drop your credit scores significantly. Pay your bills on time. Recent delinquent payments and collections can have a major negative impact on your credit scores. At FirstHomeBuyers, we believe you can achieve the dream of owning a home if you are willing to do the work to improve your credit and we can set you up on an action plan to keep you on track on the road to homeownership. Trended Data Credit Report Coming Soon! In September 2016, trended data may affect your ability to qualify for the first home buyers program. Lenders will be using a more detailed credit report which will show the amount owed, minimum payment, and payment made. Trended credit reports will benefit borrowers who make more than the minimum required payment on their revolving debt. View Trended Data Credit Report example. 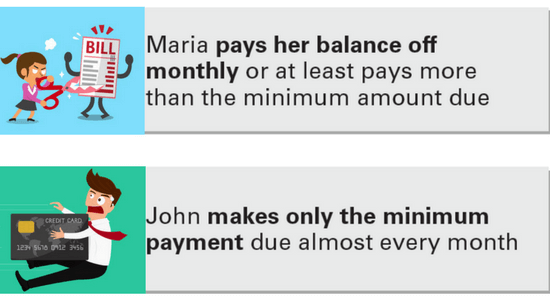 Assuming John and Maria's credit histories and loan characteristics are otherwise about the same, Maria will be considered a lower credit risk in underwriting risk assessment.